Scientists have long been interested in understanding animal migration, but gathering migration data proved difficult in the past. For example, the process of catching and recapturing migratory songbirds using mist nets is a laborious process. In the past, recovering songbirds produced data only about the breeding location and their migration destination, and rarely about the migration itself. Studying the mechanisms of migration for short-lived species such as butterflies was especially challenging because they undergo multiple generations within a migratory route. Advanced technology now permits scientists to collect more information about the migratory journey. At Indiana University, Dr. Adam Fudickar and his collaborators use cutting-edge technology to study how environmental change affects animal migration and threatens biodiversity and agriculture in Indiana. Fudickar, who is a research scientist in IU’s Environmental Resilience Institute (ERI), has always been interested in animal migration. Fudickar spent several years studying populations of dark-eyed juncos, small songbirds native to North America that vary in migratory behavior. He measured hormone levels and gene expression to assess how populations differ in timing of migration and reproduction and employed GPS loggers to determine migration distances within a population of short-distance migrants. A moth attached to the cardinal-direction logger, a technology used to determine the direction of the moth’s preferred flight (Credit: Abby Kimmitt). More recently, Fudickar began studying migration within the context of environmental change. His integrative research approach incorporates techniques ranging from physiology to remote data-recorders to gain a comprehensive understanding of migration. Activity loggers, a recent innovation, allow him to study animal behavior both in the wild and captivity. 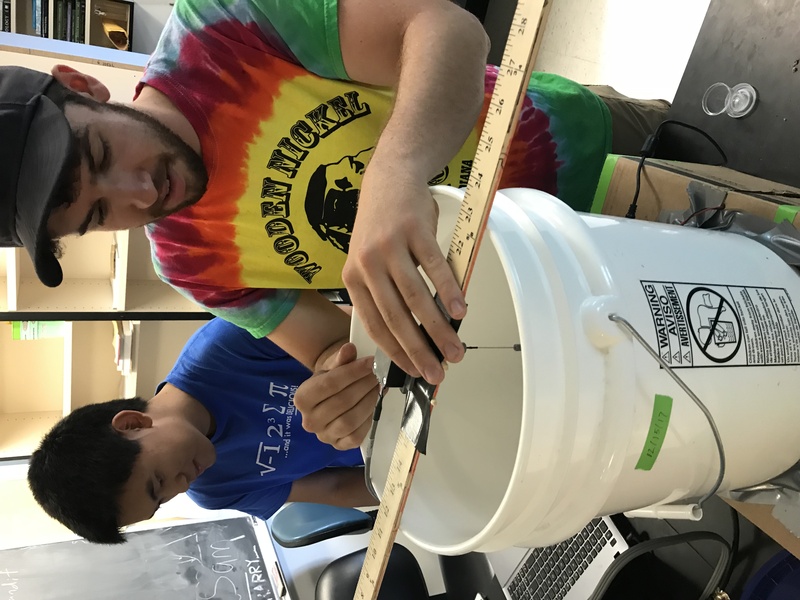 Under the funding of the National Science Foundation, and in collaboration with Dr. Geoffrey Brown from the School of Informatics and Computing, Fudickar and undergraduates Dillon Gaughan and Jiawei Chen work with the loggers to determine thresholds for activity to determine when a bird is flying or resting (e.g., how many wing beats indicate a bird is flying). 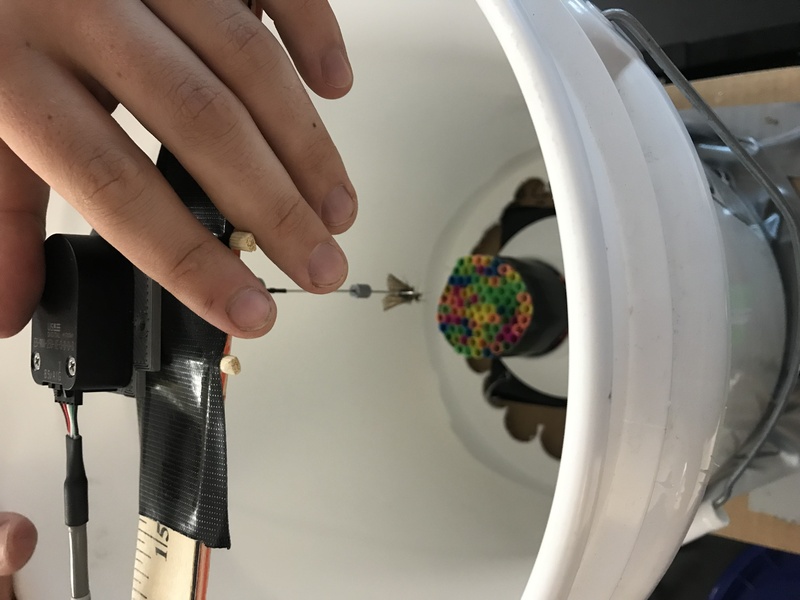 “[Brown] has worked in industry and academia, and he is very qualified to be creating top quality technology to answer these types of questions,” says Fudickar. Activity loggers weigh less than 1 gram so that they can be placed on small songbirds without harm in order to record accurate wing beat measurements. Fudickar is excited that his new work allows him to gather detailed information about birds’ migratory behavior during flight. Once the team establishes thresholds for data collection, the loggers will hopefully run continuously for up to a year. Fudickar believes this technology will provide new insights on timing and energetics of bird migration. This technology will support studies on climate change and its effect on the timing and success of animal migration, and it will generate ways to protect the biodiversity of birds of economic and cultural significance to people. In addition, Fudickar is funded by the ERI to study the cues and mechanisms that determine migration timing of agricultural pests, such as the Black Cutworm, a native, noxious moth. The Black Cutworm threatens Indiana corn crops, especially if adult moths arrive and lay eggs early in the growing season. Black Cutworm eggs hatch in 5-10 days and mature to adults in six weeks, resulting in 3-4 generations per year. 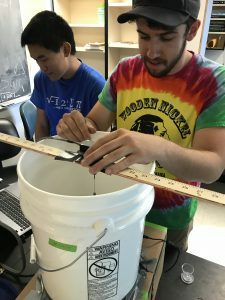 Fudickar and undergraduates Sam Stratton and Chen, work to determine the environmental cues that stimulate Black Cutworm migration and breeding. Fudickar hypothesizes that changes in day length, rather than absolute day length, cue moths to select migration direction. Undergraduates Jiawei Chen (left) and Sam Stratton (right) here are recording moth behavior in the lab using the cardinal-direction logger (Credit: Abby Kimmitt). Chen and Stratton have developed a program and device to log the direction of a moth’s preferred flight direction. The team raises moths from eggs in two different artificial light treatments: an advancing day length and decreasing day length. When the moths reach adulthood they are attached to a cardinal-direction logger; the data will reveal whether day length during the developmental stage affects migration direction. 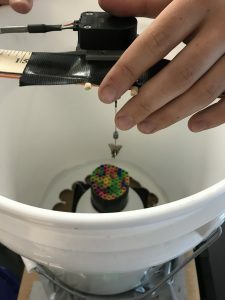 This project is just the start: once the Fudickar lab identifies environmental cues determining the timing and direction of moth migration, they will next asses how environmental cues vary within a changing environment and affect moth migration. Predicting Black Cutworm migration better enables the State to manage pest control and protect Indiana’s agriculture. Fudickar’s lab will continue to answer questions critical to the health of Indiana’s wildlife and agriculture using technology unimaginable 20 years ago. The Fudickar lab is one example of how scientists are developing and pursuing the use of cutting edge technology coinciding with the study of animal physiology to better understand animal migration in the face of climate change.